Gov. 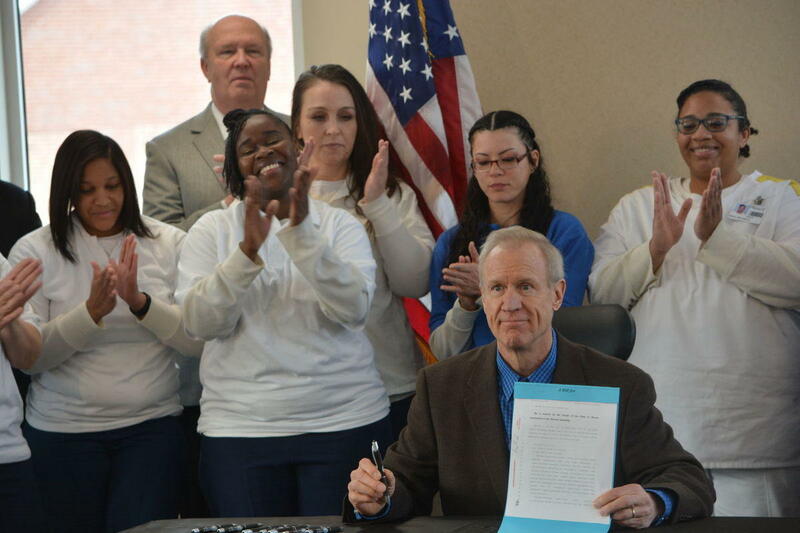 Bruce Rauner holds up the newly-signed House Bill 1479 that creates a women’s division within the Illinois Department of Corrections, as inmates housed at the Logan Correctional Center in Lincoln applaud. Corrections Director John Baldwin says the new approach will also include job training, which recognizes that most women leaving prisons are sole family providers. The National Center of Justice Involved Women's study showed that 98 percent of incarcerated Illinois women have suffered physical abuse. Three-quarters have been sexually abused. Combined with women's differing emotional responses to stress make their prison stays much different than men's.